The Teacher Education department at Red River College is hosting a Winter 2018 Information Night for prospective students interested in the Business Education, Industrial Arts and Technical Vocational Teacher Education programs. 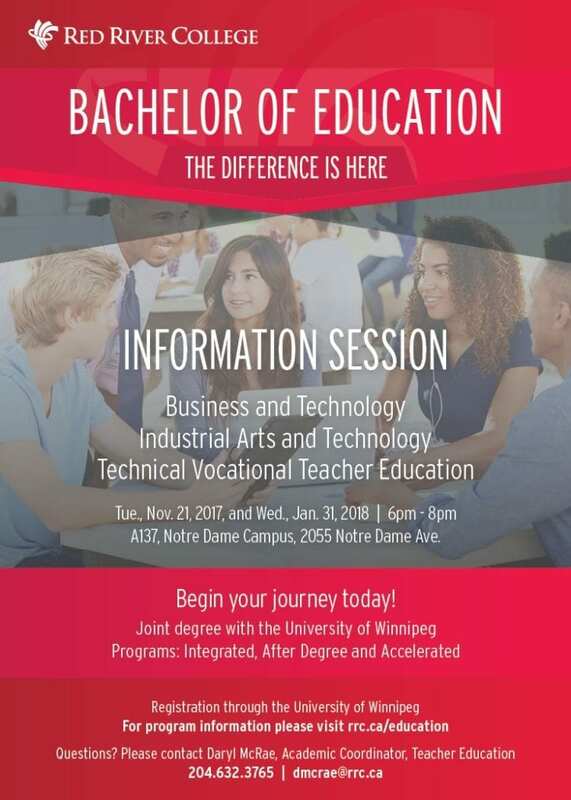 Learn about the five-year Integrated, three-year After Degree and one-year Accelerated degree programs that are delivered jointly with The University of Winnipeg. Meet in A-137 tour Red River College’s Notre Dame Campus, meet current faculty, and learn about how the program prepares students for certified career paths in Manitoba’s middle and secondary schools. We will provide program information and details on how to apply.